Our proposal for the World Trade Center site establishes an urban plan and massing scheme that provide multiple sites for innovative architecture. 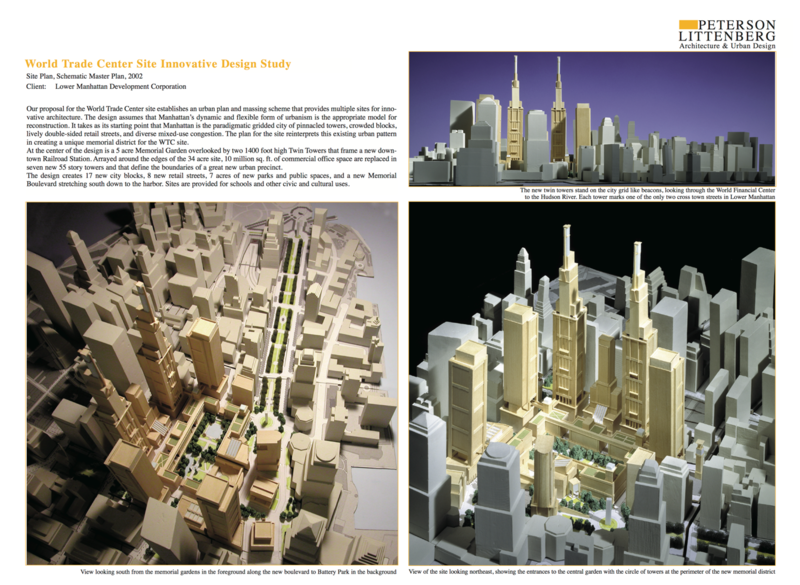 The design assumes that Manhattan’s dynamic and flexible form of urbanism is the appropriate model for reconstruction. It takes as its starting point that Manhattan is the paradigmatic gridded city of pinnacled towers, crowded blocks, lively double-sided retail streets, and diverse mixed-use congestion. 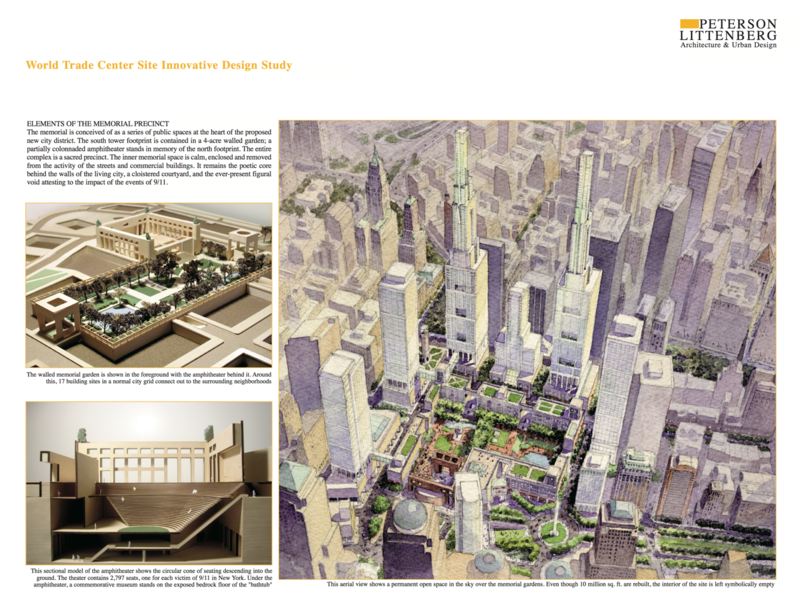 The plan for the site reinterprets this existing urban pattern in creating a unique memorial district for the WTC site. At the center of the design is a 5 acre Memorial Garden overlooked by two 1400 foot high Twin Towers that frame a new downtown Railroad Station. Arrayed around the edges of the 34 acre site, 10 million sq. ft. of commercial office space are replaced in seven new 55 story towers and that define the boundaries of a great new urban precinct. The design creates 17 new city blocks, 8 new retail streets, 7 acres of new parks and public spaces, and a new Memorial Boulevard stretching south down to the harbor. Sites are provided for schools and other civic and cultural uses. Our urban design plan establishes a new district of blocks and streets on the World Trade Center site that integrate it with the surrounding neighborhoods. The district is organized in concentric rings, circling out from the footprints of the two fallen towers and the central Memorial Garden. The first ring is a narrow layer of 10 story buildings that define the Memorial Garden on the inside and forms the normal edges of city streets on the outside. This wall separates the garden from the city’s daily activities and enables double-sided retail streets to form a layer of space passing around the site. The final ring is the outer layer of commercial towers on the edge of the new memorial district. Stretching south, a new 3/4-mile long Memorial Boulevard connects the site to New York Harbor, Ellis Island, and the Statue of Liberty. Each end is marked by a circle with a vertical memorial that can be seen along the streets into the heart of the city. 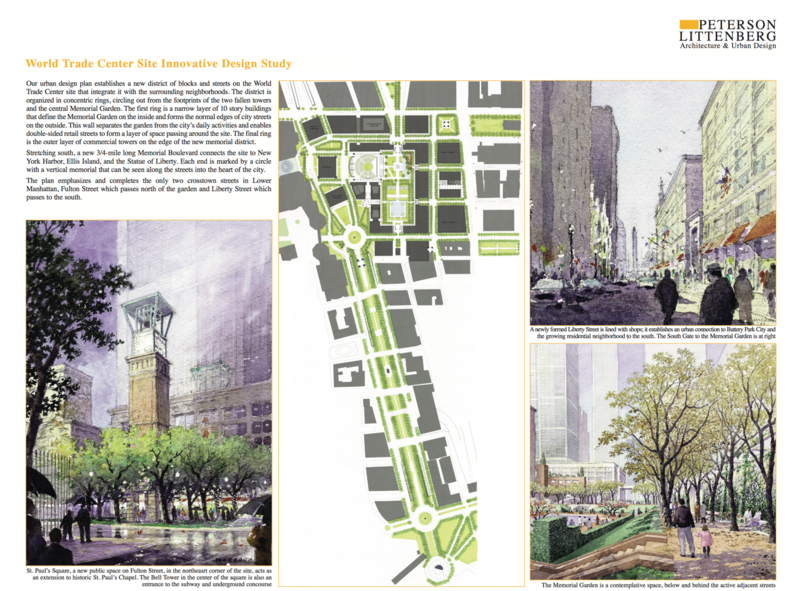 The plan emphasizes and completes the only two crosstown streets in Lower Manhattan, Fulton Street which passes north of the garden and Liberty Street which passes to the south. The memorial is conceived as a series of public spaces at the heart of the proposed new city district. The south tower footprint is contained in a 4-acre walled garden; a partially colonnaded amphitheater stands in memory of the north footprint. The entire complex is a sacred precinct. The inner memorial space is calm, enclosed and removed from the activity of the streets and commercial buildings. It remains the poetic core behind the walls of the living city, a cloistered courtyard, and the ever-present figural void attesting to the impact of the events of 9/11.